Personally, my favorite tourist attractions are ones where you can do a number of things at once. It just feels like a better use of time when you visit a business or park, and you get a couple of activities in, instead of just one. That’s what Tollen Farm offers people looking for an “Oregon” experience. From unique and quirky art, to home décor, garden items, farm animals and antiques, the farm is a great way to take home something from the Willamette Valley that is one-of-a-kind. The brain behind this wonderful little shop and farm is Tonie Tollen. She purchased the farm in 1979, which has, if not the oldest, one of the first houses built around Wilsonville. She has kept it mostly intact, and can tell stories on any number of topics, from the history of the property, to each piece of artwork she has nestled in her small shop off Tooze Road. The first thing you notice when you drive up to the farm is the chicken on the sign. 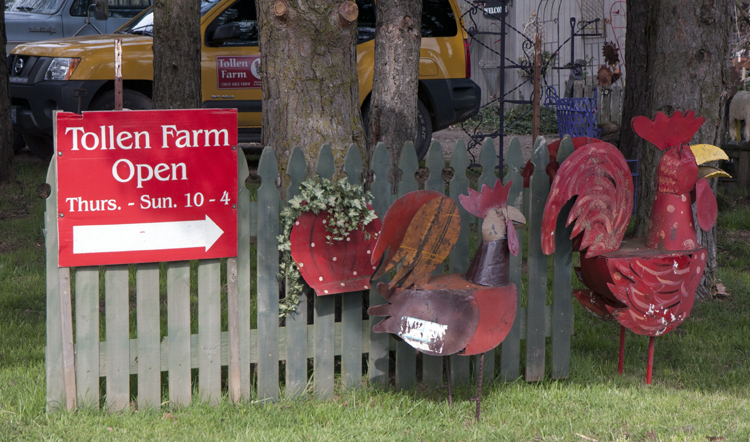 The chicken is a theme throughout the shop and farm – it’s Tollen’s logo, even though she no longer has chickens. The two blond dogs will meet you at your car, and if you aren’t careful, give you a nice slobbery kiss on the hand too. Even though chickens are only inanimate objects on the farm, there are plenty of other live animals to see, pet and even purchase. The 5-acre farm does have livestock. Some of the cutest farm animals you will ever see. “It all started with sheep to eat the grass,” Tollen said. “I have been raising sheep for 35 years and used to have lambs born in the winter, now we have spring babies so I don’t need to freeze my toes waiting all night in the barn during the winter months for the babies to arrive. She raises the sheep for their wool and for meat, as well. While she is down to only a few sheep, the miniature donkeys are really the stars of the show. The little donkeys, all standing about hip-high and very friendly, all have little mohawks and are cute little creatures, with names like Cowboy, Smoochie, and Chocolate Surprise. “They may look small but they are very smart and extremely tough little animals. They can carry 50 pounds when full grown and haul 500 pounds. Minis are used as companion animals for other equines, as guard animals for sheep, and they make great pets,” Tollen said. She has several stories about how her herd of miniature donkeys has protected sheep, and each other, from coyotes. But when you meet the small animals, all they really want is to be petted and scratched behind the ears. Tonie describes her farm and shop as a good place to make memories, and even has a seating area set up for small groups to book lunches and teas. Her property has great views of Mt. Hood and is filled with native plants that bloom during the summer. She doesn’t use any chemicals on the property, and even has fresh nuts, apples, plums and pears. So whether you are looking for wool for a spinning project, a unique piece of art or a one-of-a-kind gift such as a chicken statue or miniature donkey, or simply want to stop and enjoy the farm life for an hour, Tollen Farm is a great spot to take a rest from a busy day on the road. About Tollen Farm (from www.tollenfarm.com): A world of delights awaits you at Tollen Farm. Enjoy the beauty of trees and flowers in bloom as you explore and view the orchard and garden. Take pleasure in watching children happily feeding carrots to the miniature donkeys. Allow yourself to forget your cares when you see the spring lambs at play. Experience the excitement of finding one-of-a-kind treasures for your home and garden. What to bring: This is a farm, so if you do plan on seeing the animals make sure you wear clothing that is weather appropriate. Tennis shoes and boots are your best bet if you are going to take the time to meet the horses, donkeys and sheep. So make sure to leave the spike heels in the car. And don't forget your camera for those memories. Tip: Since this is a small operation, if you want to see and pet the animals, make sure to call ahead, at 503-682-1604, to make an appointment. You can risk it, and simply show and hope the owner has time to bring the horses, lambs and miniature donkeys up for you to meet. Don’t be afraid to ask her questions, as she has a story about many of the animals on the farm, and unusual items in her shop, and they are very interesting and funny.